Around 1,100 tourists, a record number, visited Hrodna Region between 26 March and 2 April 2017, according to Belta news agency. Since October 2016, it is possible to visit the region for five days visa-free. This growth in tourism has occurred despite inconvenient entry procedures: the authorities restrict visits to five days, limit where tourists can go, and prohibit entering the country via certain modes of transportation. Over the last months, infrastructure, food services, and lodging in Hrodna Region have been developing. However, attracting more foreign investment and modernising housing, air, and railways would do much to increase the capability of the city to host more tourists. The amount of tourists in Hrodna continues to grow. In total, more than 7,500 tourists have come to Hrodna since October 2016 thanks to the new visa-free regime. The majority of visitors come from Lithuania or Poland. Lithuanian and Polish travel agencies are popularising weekend trips to Belarus through package deals. For instance, Beta, a Lithuanian travel agency, offers single-day tours called 'Royal Hrodna' for $20. The tour includes visits to churches and historical places with buses departing from three Lithuanian cities: Vilnius, Kaunas, and Alytus. Since October, Hrodna Region has also been attracting visitors from Latvia, Germany, Italy and 35 other countries. Augustow Canal is gradually becoming one of the most popular destinations. In response to increased interest, authorities plan to open new border checkpoint at the territory of Augustow canal on 28 April. Liasnaja-Rudavka will become a border checkpoint for boats, pedestrians, and bicycles. Starting in late April, several new 50-km bicycle routes will be built along the canal. Belarus can also expect increased tourism in other parts of the country as well. In February 2017, authorities announced visa-free entrance for nationals of 80 countries if they arrive via Minsk airport. Moreover, according to the Ministry of Internal Affairs, Belarus plans to introduce 12/14-day visa-free entrance instead of five. Belarusian minister of tourism and sports Aliaxandr Šamko reported an increased demand at health resorts. This factor may also contribute to extending the legal length of visa-free visits. While travelling around Hrodna, tourists are restricted to car and bus travel. Several factors could explain this: Lithuania decommissioned the railway connection to Druskininkai after the fall of the USSR. The future of the Hrodna-Warsaw and Hrodna-Bialystok connections was also called into question in late 2015. The instability of rail connections may explain the decision not to include rail travel in the visa-free zone. Recently, customs officers in Hrodna stopped Polish producer Piotr Dudanowicz and two German musicians at the border and forced them to return to the nearby Polish town of Kuznica. The three foreigners had travelled by train to Hrodna instead of taking the bus. The musicians had to wait more than 10 hours for the next bus in order to come back to Belarus. Airplane travel to Hrodna is also impossible. Hrodna airport, like all other airports in Belarus, has failed to introduce budget flights. Moreover, authorities did not include the airport in the visa-free zone. Officials still voice doubts about introducing budget airlines in the Minsk airport due to the 'discrepancy of low-cost flights with the rules of Minsk National Airport', according to chairman of Minsk national airport Dmitry Melnikian. The number of tourists increased but complicated procedures and small print create inconveniences for travellers. Customs officials count the day of arrival and departure as whole days. Experienced tourists advise crossing passport control after midnight if the flight arrives several hours before. In March, two Canadian musicians were fined $3,000 for counting the days wrong, reports KYKY.org. 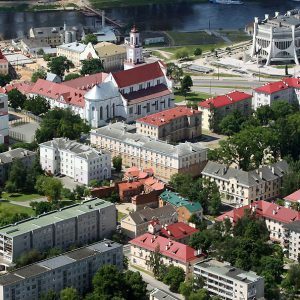 Can Hrodna Accommodate More Tourists? Although the amount of tourists continues to grow, services for tourists remain limited in variety and quality. Only 8 hotels and one hostel function in Hrodna, according to Booking.com. In cities with comparable populations in neighbouring countries, the numbers differ significantly. The Polish city of Bialystok has 19 hotels and nine hostels, Lithuanian Kaunas has 24 hotels and seven hostels, and Ukrainian Lviv has 20 times more hotels. However, over the last months, Hrodna has been developing infrastructure for tourists. The second hostel with cheap prices (around $5 per night) opens in May. However, both hostels can only accommodate 100 tourists. Recently, Burger King announced the opening of a facility in Hrodna, making it the first international fast food chain in the city. The lack of English-speakers continues to be a significant problem for tourists. Polish and Lithuanian tourist groups often travel on guided tours and have a guide who speaks their language. However, for tourists from other countries, communication remains a challenge. Recently, around 15 waiters in central cafes and restaurants enrolled in special English courses. Some tourist activities are not well suited to foreigners. The number of tourist agencies in Hrodna dealing with inbound tourism has increased compared to last year, from 10 to 70. Nevertheless, the city currently lacks a tourist information centre. While Augustow canal is preparing several bicycle routes, bicycle infrastructure in Hrodna remains inadequate, according to the cyclist organisation Vela Hrodna. Additionally, there are few possibilities to rent quality bicycles close to the bus station. A recent journalistic investigation conducted in Minsk by Alena Vasiljeva claimed that certain unique traits of Belarus could be turned into national brands. Safety and the relative absence of racism, as some travellers have noticed, makes Belarus different from many countries. Foreigners have also picked up on the Soviet nature of architecture and even daily life. Lithuanian tourists have praised the quality of Belarusian underwear and coffee. Even though Belarus has made important strides in improving the tourism sector, more work is necessary. The first step should be increasing the number of hotels, at least to the level of neighbouring Kaunas or Bialystok. Another vital step would be improving the level of English for staff in hospitality industries, improving tourist centres, and working on bicycle infrastructure. Another option to make foreign visitors feel more welcome could be creating an English-version of video guides. The project 'Tourism without a bag' could provide a fitting example. Simplifying investment opportunities for foreigners would also contribute to the development of the city. This would allow Hrodna Region to handle an increasing amount of tourists and reach a higher level of development. After a meeting with Alexander Lukashenka on 3 April in Saint Petersburg, Vladimir Putin announced that all oil and gas issues between the two countries had been resolved. The media in Belarus reported on the Kremlin's concessions extensively. However, what Minsk will provide in return remains unclear. Belarusian leader Alexander Lukashenka provided a clue when he said that the summit dealt more with security than with energy issues. Moscow indeed wants closer collaboration with Minsk in the realms of security and foreign policy. On 31 March, before the summit, Russia's Security Council held a meeting on Russian-Belarusian relations. The two governments clearly chose to resolve the issues critical to each of them: Russian gas and oil supplies for Minsk, Belarusian security and foreign policy cooperation for Moscow. Nevertheless, numerous other issues continue to undermine relations with Russia. Now, even leading experts in the Belarusian government doubt the utility of Moscow-led Eurasian integration in its current form. Assessments of the results of the Petersburg summit differed starkly among Belarusian and Russian media sources and analysts. For instance, the Russian liberal daily Kommersant argued that Moscow had ceded almost every possible position, and implied that Lukashenka came out on top. Meanwhile, many Belarusian analysts, such as Dzyanis Melyantsou, insisted that Minsk must have given something valuable to Moscow in exchange. The media reported extensively on what the Kremlin agreed to give to Minsk: Russia will offer Belarus a discount on gas beginning in 2018 and resume petroleum supplies to Belarus at previous volumes. However, a clue to what Minsk agreed to in exchange was provided by Lukashenka himself when he announced that national security issues were the most important subject of discussion at the summit. Although this solution to the dispute had already been voiced last summer, it was only now that Russian leadership made the proposal. Two major international developments are likely to have influenced Putin's move. The first is the geopolitical situation in the region. With Russia's hopes that Trump would be more acquiescent dashed and tensions in Eastern European as high as ever, Moscow needs a less recalcitrant Minsk to deal with numerous urgent problems. In particular, Moscow needs Minsk to host a massive military power show, the military exercise West-2017. So far, Belarusian officials have downplayed the confrontational aspects of the exercise, emphasising the necessity of transparency. Minsk is extremely averse to further challenging Russia's opponents in this way. Second, Moscow would probably like to put a stop to Minsk's latest attempt to bring non-Russian oil to the region through a regional cooperation scheme. Minsk has already succeeded in quietly bringing in Azerbaijani oil, and has recently started to purchase Iranian oil as well. In both endeavours it collaborated with Ukraine; in the latter it may even have had the help of Poland. The current Russian leadership has bones to pick with both these countries. However problematic the results of these efforts may seem at the moment, they are not hopeless. The efficiency of such oil schemes could increase if Belarus succeeds in making its diversification attempts a collective project undertaken together with other countries of the region. Minsk understands this: its deals with Ukraine and contacts with other countries prove it. We will soon complete the modernisation of our refineries … As soon as this is finished, the output of white oil products at our refineries will reach 95%, so the problem of petroleum [imports] will disappear by itself. We will be able to buy oil from anywhere, recycle it within the country, and make appropriate profits. The Russians also realise this. The most recent oil and gas dispute between the two countries lasted more than a year. 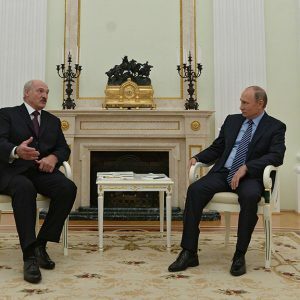 Over the course of the feud, the Belarusian government took several eyebrow-raising demarches: Lukashenka refused to participate in the Collective Security Treaty Organisation (CSTO) and Eurasian Economic Union (EAEU) summits in December, and Belarus would not sign the Customs Code of the EAEU last year. The director of the government-affiliated Economy Institute of the Belarusian Academy of Sciences, Valery Belski, harshly criticised Eurasian integration in an article written on 13 March for the largest Belarusian internet portal Tut.by. As he proclaimed, 'the value of the Eurasian Union for Belarus decreases if the prices for energy resources are not made closer [to domestic Russian prices]'. This sentiment neatly encapsulates the conclusions the Belarusian government is drawing from its dispute with the Kremlin. For instance, Belarusian prime minister Andrei Kabyakou on 7 March emphasised that the difference in natural gas prices paid in Belarus and Russia had grown from 38% in early 2014 to 110% in 2016. This makes Belarusian enterprises less competitive, as their products become more expensive than Russian ones. And that, of course, contradicts the agreements on Eurasian integration. The gas dispute also brought other matters of contention to the forefront: reduced oil supplies, disputes over Belarusian food exports, Russia's border checks with Belarus, replacement of Belarusian details in Russian industrial products, limiting access of Belarusian firms to Russian defence programmes, etc all hinder bilateral relations. Many of these problems have been festering for years. What's more, Minsk points out that many of these issues are of a political rather than economic nature. Agricultural exports to Russia is a case in point. In November 2016, Rosselkhoznadzor, the Russian government agency which oversees agriculture, announced that it had discovered bacteria in meat imported from the Belarusian Vitsebsk Broiler Poultry Factory. It promptly banned all products from the firm on the Russian market. In February 2017, however, Rossekhoznadzor allowed products from the same Vitsebsk firm to be presented at the Prodexpo-2017 exhibition in Moscow and awarded them prizes for high quality. Nevertheless, Rosselkhoznadzor refused to remove restrictions on Vitsebsk poultry products in Russia. In short, Belarusian-Russian relations suffer from more fundamental problems than simply trade disputes between close allies. At the Saint Petersburg summit, the two governments resolved the most urgent issues in the energy and security spheres. However, numerous other problems persist, despite long years of declared integration. For this, the political attitudes of the Kremlin bare much of the blame. New disputes between Minsk and Moscow are sure to arise in the future.